Mykonos by Seaside - Courtesy our friends at Fotolia Mykonos by Seaside. Good things come in small packages, and nowhere is that more obvious than on the tiny Greek island of Mykonos. All 100 square kilometers of it are alive with a spirit unrivaled in the world. A spirit that has attracted the international jet set since the mid 1970s and now attracts millions of visitors each year. They come for the beaches, they come for the scenery, and they come for the nightlife. 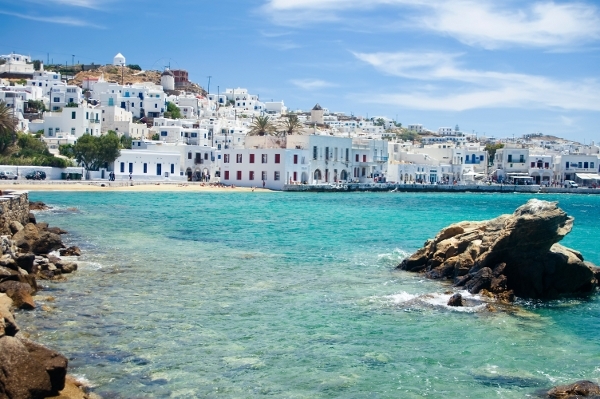 After Athens with its Parthenon, Mykonos is one of the most popular destinations in Greece. 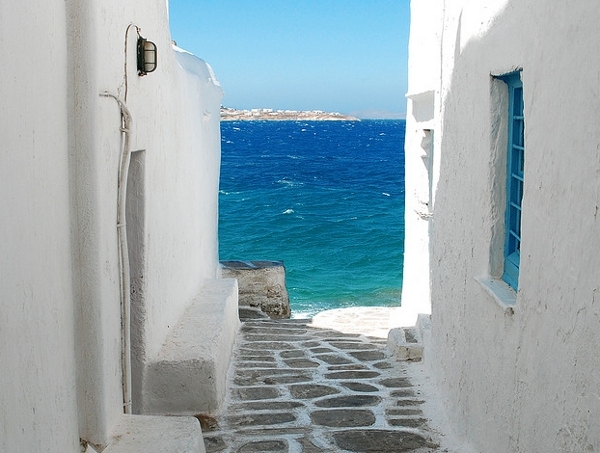 Mykonos is located in the Cycladic Island group, in the middle of the Aegean Sea. It is a small island with a very big name. Every summer millions of tourists set foot on this tiny piece of land that pushes out from the deep blue sea to experience its magical beaches and epic nightlife. When you arrive in Mykonos, the first thing that strikes you is the architecture. By municipal decree, all buildings must be white and square with a flat roof. This is a leftover from bygone times when white square buildings looked like a walled city from a distance, discouraging pirates from attacking. This architectural tradition has been maintained, and gives Mykonos its unique, postcard look. What will strike you next is not tangible. It is like a whisper that circulates through the island, gently nudging you to let down your hair, wear some light linen, and go for a walk in town. Mykonos town is a maze of small narrow streets where you find everything from high end jewelry shops, bars, clubs, and eateries, and here’s a little tip for you: Some of the best Italian food outside Italy can be found hidden in little corners and hidden alleys. For those of you who are inclined to absorb ancient Greek history, fear not, the island of Delos, a short boat ride from Mykonos, has the ruins of a temple to Hera, and a villa with a mosaic floor in honor of Dionysus, the god of merriment, wine, and orgies. This is proof that the spirit of the island has been present since the time of the Ancients. Now with the sightseeing out of the way, time to do what you really came for, grab your bathing suit, towel, and shades, and head to one of the many famous beaches on the island. For those of you that like to get crazy and party like an animal, Paradise or Super Paradise offer daily afternoon parties. Paraga Beach for those of you in the know, or Elia if watersports are your thing. I personally like to find beaches which are not commercially exploited, no lawn chairs, no bars, no restaurants and no mini markets; Agios Sostis is my favorite, and it is also a favorite of the yacht crowd. One thing is a given, regardless of where you go, the waters will be blue and crystal clear, the teeming life within them a testament to their cleanliness. Tanned, energized, and maybe a little tipsy? Time to hit the town for dinner. Make sure you don’t start too early, or you will feel lonely. Dinner is usually at 10 or 11 pm in Greece, and starting around 1 am, the bars in town are the place to be. Queen Bar, Rock n Roll, Scandinavian, and for a little bit of spice, check out Jackie O’s, and the seed of all nightlife on the island, Pierro’s, the world’s most famous gay bar, and an attraction in its own right. The town at night is also your best chance to spot international celebrities. Kevin Costner, Johnny Depp, Paris Hilton, and Lady Gaga are among the most recent visitors to this little paradise. Below Evan Paley interviews Mario Hertel, owner of Paradise Club in Mykonos, in a segment of Europe After Dark.